Old Town is a little treasure in the centre of Rotterdam which opened in 2017. This family-run restaurant is specialised in Malaysian and Cantonese cuisine and qualifies itself as Asian fast food. Any negative association with fast food needs to be curbed at the door, this has nothing to do with traditional fast food. Yes, the service is quick and the prices are low, but you have all the time in the world to enjoy your dish, the food is not rushed, is of high quality and packed with fresh produce. The service is beyond good: you feel like part of the family. 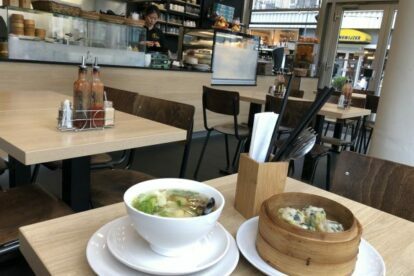 On a particularly cold and windy day, was ordering away and trying to get warm again when the owner said “you need a soup”. She was right I did. The wan tan soup is so fresh and uplifting! A healthy broth with vegetables and dumplings is all you need to get energised. This is my new pick-me-up; move over, chicken soup. The sticky rice steamed in lotus leaf with chicken and Chinese mushrooms is indescribably yummy — there are simply not enough adjectives in the English language. The Malaysian sate is so good and the variety of dim sum, both steamed and fried, makes choosing a bit of a nightmare in the best sense. This is inviting, flavoursome, quick, inexpensive healthy food which tastes like a holiday without any of the guilty calories.